The I/S sauna provides the best of both worlds. You like traditional sauna but your spouse prefers infrared sauna? No problem. On weekends you like a traditional sauna taken with others–and with lots of steam–but during the work week you like the mild-soothing infrared sauna heat therapy? No problem. The Infra Sauna (TM) by Saunatec(R) is the ultimate sauna–a blending of our Traditional Finnish Saunas with our CarbonFlex(R) Infrared Technology. This wonderful Infrared sauna combination room provides pleasure beyond what a traditional or infrared sauna can do individually. 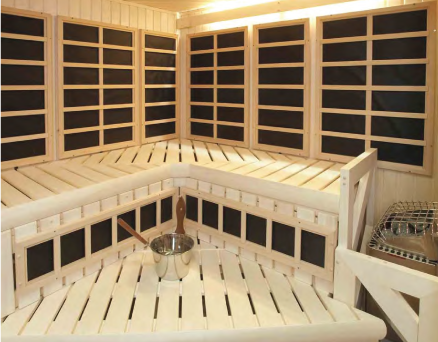 Saunatec’s CarbonFlex far-infrared heating system can be incorporated into virtually any sauna room design. Like getting our two biggest sellers in one! No other manufacturer offers a safety-listed (ETL or UL) combination room like the IS 44. Available in a “plug-n-play” 15 amp 1.7 kw version or a 20-amp dedicated outlet, 2.2 kw version. *Note: the 20 amp version will not get hotter than the 15 amp version. It will however, get up to temperature faster. This is a very versatile and highly portable “show-stopper”. Perfect for the user, or couple, that wants both types of sauna experiences. Not a “settle for” room in either mode. Regardless of type of heat desired, the user will enjoy their IS44 experience!